A brick and tile building built during the late 17th century, with 18th century alterations.The building has an unusual cruciform brick vaulted cellar, with a large oven. A concrete pillbox from World War Two is disguised as a shed at the east end of the building, overlooking a road junction. Corner High Street and Old Road. House of 3 bays, 2 storeys, brick, slightly chequered (ground floor of facade rendered). String course between floors. Traces of a narrower blocked window on upper floor. Wall plate visible along eaves. Georgian classical doorcase. Chimney, probably later, against southeast gable. Probably a late 17th century house altered in 18th century. To be restored? E. Rose (NAU) 15 November 1978. See (S3) in file revealing original mullioned window? now sealed by roof of penthouse, and remarkable brick vaulted cellar, cruciform, with oven from which a vent rises apparently to the main fireplace. House now sold to different owner. See (S4) which reports a concrete machine gun post at east end to control road junction in World War II, disguised as shed. D. Gurney (NLA), 17 November 1996. The World War Two remains around Acle constitute a system of national importance. D. Gurney (NLA), 27 December 2001. --- Newspaper Article: Eastern Daily Press. 1981. Manor House 'boost' for Acle. 23 September. --- Newspaper Article: Eastern Daily Press. 1979. Acle Manor House to be Restored. 24 November. --- Newspaper Article: Eastern Daily Press. 1988. Manor House award winner. 15 January. --- Aerial Photograph: Edwards, D.A. (NLA). 1996. TG 4010H. --- Newspaper Article: Eastern Daily Press. [unknown]. 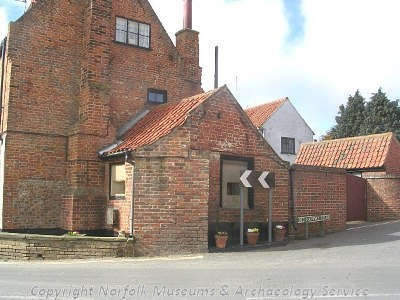 Acle House Restoration Complete. [unknown]. <S1> Unpublished document: Council for British Archaeology. 2001. Defence of Britain Project: Acle (Defence Area 3)..
<S3> Unpublished document: NARG. 1979. Building Survey. <S4> Monograph: Wills, H.. 1985. Pillboxes: a study of UK defences, 1940. p. 58. <S5> Unpublished document: 1995. Norfolk Defensive Structures Survey.